Aisam-ul-Haq Qureshi and Rohan Bopanna have won their first ever ATP Masters tournament after beating the wild cards Julien Benneteau and Nicolas Mahut in straight sets. The Indo-Pak Express took 65 minutes to defeat Benneteau-Mahut 6-2, 6-4, to win ATP Paris Masters title. This victory became their third title of the year preceeding Gerry Weber Open in Germany and Stockholm Open. 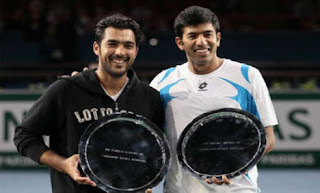 Aisam and Rohan have already qualified for the season finale in London. With this victory they have earned 1000 ranking points each and split euro 134,500 as prize money. With this win now they are placed at number 5 in ATP Doubles Team Ratings.